Gloriously easy, these tasty beef meatballs will please kids and grown-ups. Serve with sticky white rice. For the meatballs, place all of the meatball ingredients into a large bowl and stir to combine. With damp hands, take a large mound of the minced meat mixture and mould into a ball that is a little larger than a golf ball. Place on a plate and repeat with the remaining meatball mixture. For the finished dish, pour the groundnut oil into a large deep pan and heat over a high heat. Using a metal ladle, carefully lower each meatball into the oil and spoon some of the oil over the meatballs. Cook for 4-5 minutes, or until golden-brown all over. Pour all but two tablespoons of the cooking oil out into a heatproof bowl. 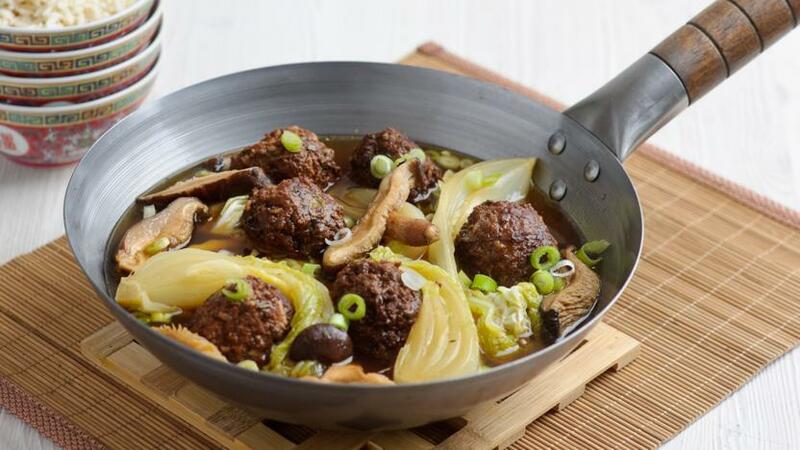 Add the stock to the pan and arrange the slices of Chinese cabbage around the meatballs, curving them around the sides of the pan lengthways, then add the mushrooms and soy sauce and bring to the boil. Cover the pan, reduce the heat and cook gently for 15 minutes. Alternatively, cook the meatballs in the oven; arrange in a casserole dish, cover with kitchen foil and cook in a preheated oven at 100C/210F/Gas ¼ for 30 minutes. If the sauce is too thin, add the cornflour paste and stir until thickened. Take the meatballs off the heat and season, to taste, with sea salt and ground white pepper. Transfer to a serving dish, garnish with the spring onions, sprinkle over a dash of seame oil and serve immediately.